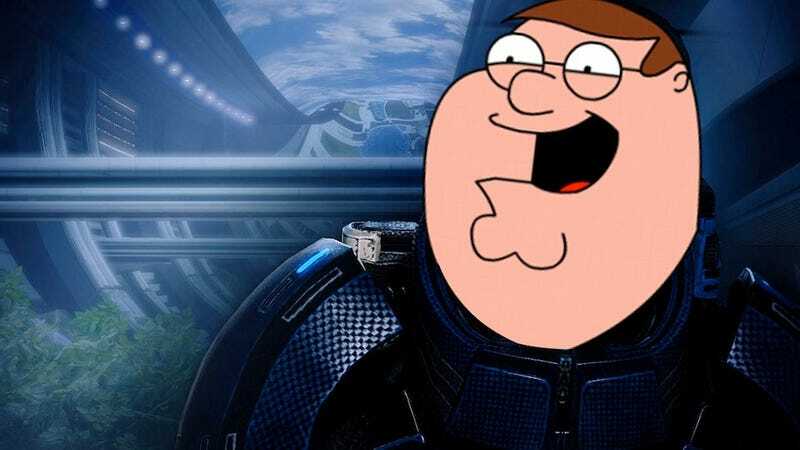 Activision's new Family Guy game will feature a parody Mass Effect level called "Mass Erect," according to a source with ties to the game. Update: In a statement to Kotaku, sent after their original statement and after the publication of this story, Activision said none of this content will appear in Family Guy: Back to the Multiverse. The details and photos we saw may have been part of an earlier version of the game. I haven't seen Family Guy: Back to the Multiverse, which was revealed (through a leak) last week and confirmed a couple of days ago. So take these details with a grain of salt. But I was contacted by someone who had screenshots of a Scooby-Doo spoof allegedly from the game and offered up some other details as well. For one, the source said, you'll get to pick from different Family Guy characters and use them to shoot down mini-bosses like a vampire version of actor and recurring Family Guy fixture James Woods. The source says there's a giant monkey boss. And the aforementioned Scooby-Doo spoof in which you can visit the Murder Machine, a send-up of the cartoon series' iconic Mystery Machine van. "When you got too close to the vehicle there was weed coming out and your vision and the music got all blurry and distorted," the source told me. I've seen (super-blurry and distorted) pictures of the Scooby-Doo parody, although I have not been able to verify that it will be in the final version of Family Guy: Back to the Multiverse. When asked for comment, an Activision representative told Kotaku: "We haven't released any game details at this time, but we'll have more info for you soon."